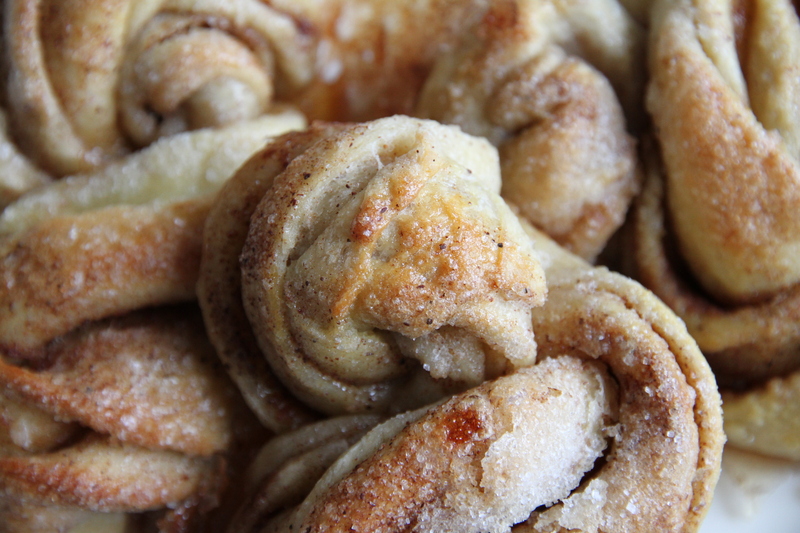 And if you wonder whatever that means, snurrs or kanelsnurrer, I can tell you that a kanelsnurr means cinnamon swirl or roll, and is a delicious yeast bun of Norwegian origin. And even though I found the recipe in a Danish baking book by Claus Meyer, it turned out to be Norwegian. He had tasted these buns at some baking-event in Norway, and ever since he couldn’t eat or smell anything cinnamon without thinking of the Norwegian baker Morten Schakenda’s snurrer. After several trials and errors with help and advice from many Danish bakers and chefs, he still didn’t achieve the wanted result, and had to make a trip to the Norwegian wilderness to get the recipe. More precisely, to Morten Schakenda’s bakery in Lom. Luckily, he got it! I’m thankful for that, and so should you be. The recipe is from the book “Morten Schakenda om boller og brød og tilfeldigheter fra bakeriet i Lom” that was named the best Norwegian cookbook in 2009. And what can I say: These babies are simply delicious! 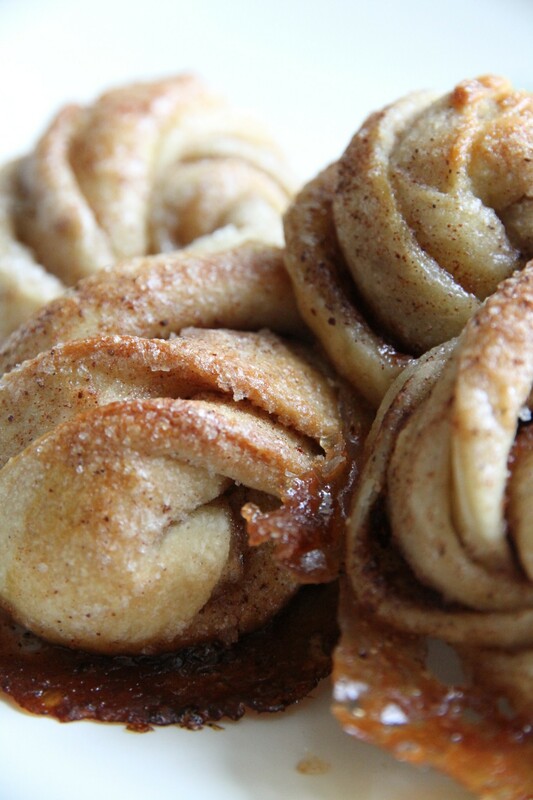 And it’s not just another cinnamon roll recipe, like you may think. Well, I guess it is, in a way…..but with a twist! First of all, they have another look than the ordinary rolls, which make them slightly more interesting. And, there’s a lot of butter in the dough, making them moist and buttery, and in my case a little dense – but that probably has something to do with the lack of raising. So, no density guarantee, but that’s not for everyone anyway. I, however, like it heavy…And what better way to end my fantastic Easter holiday in Norway with a traditional Norwegian recipe like this. So, I might have had my fair share of waffles – Norwegian and Belgian, chocolate cake, marsipan, ice cream and everything that consists of fat and granulated sugar last week, but I had to make a final thing, and it had to end sweet…And no regrets! The perfect end to a perfect easter. Pour the milk in a bowl. (The recipe says cold milk, but I would heat it up a little, my dough hardly rose at all….) Add the fresh yeast, and stir. Add the egg, flour, sugar, salt and cardamom. Knead the dough for about 20 minutes, or when you have a soft dough that is smooth and elastic. Cut the butter into small cubes and add them into the dough that will need another 20 minutes of kneading. (The long time kneading is important for the finished result). Fold a third of the dough towards the middle, and fold the other third over the first one, so you have 3 layers of dough. Roll out the dough to be 30×50/60 cm and cut it in 16 shreds. Twist every shred by grabbing it in both ends, and twist the ends in opposite directions, making 4 or 5 turns. Be careful not to squeeze out the filling. 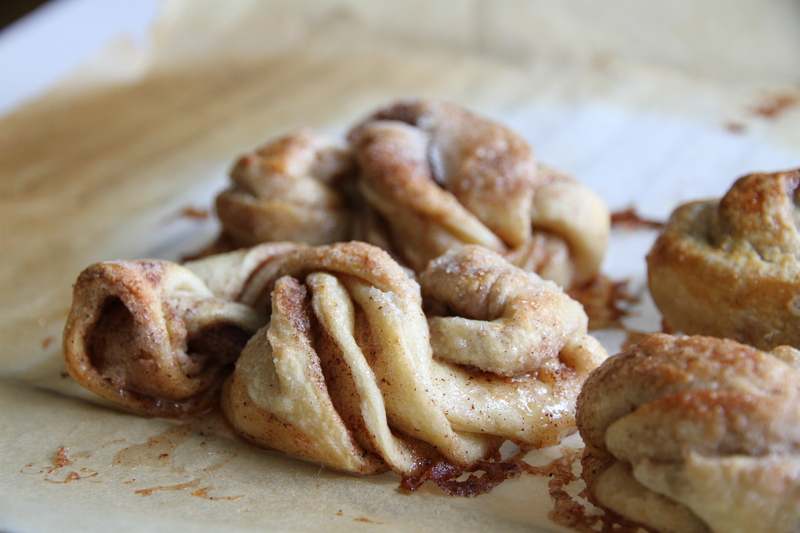 Take the twisted piece of dough with one hand, and turn it twice around your other hand’s index and middle finger. Put the remaining piece of dough over these twists, place it between your index and middle finger, and pull the fingers towards you, so the end is tucked into the bun. Place the buns on abaking sheet covered with baking paper, with the twists facing upwards. Cover and let them rise to reach the double size for approximately 2 hours. Brush the buns with eggwash and sprinkle with sugar. Bake them on 200 C for about 12-14 minutes or till they turn golden. Cool on a rack, or enjoy immediately! Perfect to break apart and eat it bit by bit, making room for a zip of black coffee in between the bites!